Built with the test in IEC 60335, Section 14 in mind. Built in a 3U enclosure, it can provide outputs up to 7200v with a virtual impedance of 39 ohm, and is provided with our fast charge power supply to allow repetitive pulses within 3 sec. The waveform generated is in accordance with IEC 61180. For automated pulse train testing, use our MegaPulse TestMinder option, which controls from a PC. MegaPulse 1.2x50-7200PF 39 ohm is a general purpose tester with 1.2x50 waveform in accordance with IEC 1180-1. The peak output can be adjusted between 400 and 7200V. The tester has a virtual impedance of 39Ω. There is no defined current waveform. This pulse is in accordance with the requirements of IEC 60335, paragraph 14, Table 6 up to a rated Impulse Voltage of 6kV. 3 second charge time between pulses. Polarity can be switched using a front panel switch. 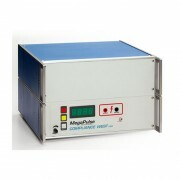 Option 950 additionally delivers a pulse in accordance with the requirements of IEC 60950 Annex N Table 1, Line N.
Option TMM: USB Computer Pulse control; 32 bit Windows computer required. Option RI: PLC Interface Relay Board to customer requirements. Option HVR: V accuum relay used for pulse switching; reduces low voltage prearcing. Option I72: IGBT used for <1000V voltage switching. Eliminates low voltage prearcing. Option TMM required. Option BNCV: 1000:1 Voltage BNC. Reference only.